Martin Kaupp studied Chemistry at Universität Stuttgart from 1982-1989, interrupted by a one-year stay 1986/1987 at University of Cincinnati (Ohio), where he gathered some experience in preparative physical organic chemistry (photochemistry) with R. Marshall Wilson. The Diploma thesis in Stuttgart with H. Stoll and H. Preuss in Theoretical Chemistry dealt with ab initio pseudopotential calculations on reactions of organozinc and organomagnesium compounds with 1,3-diazabutadienes. PhD work was carried out with P.v.R. Schleyer at the Institut für Organische Chemie at Universität Erlangen-Nürnberg, from October 1989 through July 1992. The thesis covered ab initio calculations on compounds containing heavy elements. Martin Kaupp then joined the group of H. G. von Schnering (Max-Planck-Institut für Festkörperforschung, Stuttgart), working, among other things, on relativistic effects in mercury chemistry. 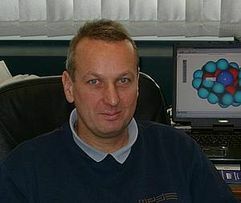 From November 1993 through October 1994, a postdoctorate at Université de Montréal (Canada) with D. R. Salahub brought him into contact with density functional theory, and he started an ongoing collaboration with Vladimir and Olga Malkin (now at Bratislava, Slovakia) on the quantum chemical calculation of NMR and EPR parameters for heavy-element compounds. After the return to Stuttgart at the end of 1994, the Habilitation in Theoretical Chemistry was completed in spring 1997 at Universität Stuttgart, followed by an appointment to Privatdozent. Since November 1999, Martin Kaupp was a professor of Chemistry at Universität Würzburg, where he headed the quantum chemistry group at the Institut für Anorganische Chemie. Since 2010, the group has moved to the newly founded Institut für Physikalische und Theoretische Chemie. Martin Kaupp's wide research interests include development and applications of quantum chemical methods to calculate NMR and EPR parameters, density functional theory,(e.g. the new class of local hybrid functionals), relativistic effects, bioradicals, and various aspects of computational bioinorganic, inorganic, and organometallic chemistry. He has been invited for many lectures on international conferences. Martin Kaupp has authored more than 200 publications and is chief editor of the book Calculation of NMR and EPR Parameters. Theory and Applications (Eds. M. Kaupp, M. Bühl, V. G. Malkin), Wiley-VCH, Weinheim 2004. Most recent awards and scholarships: 1994 Heinz-Maier-Leibnitz-Preis of the Bundesministerium für Bildung und Forschung (BMBF), 1994 Habilitations-Stipendium of the Deutsche Forschungsgemeinschaft (DFG), 1998 Heisenberg-Stipendium of DFG, 1998 Dozentenstipendium of the Fonds der Chemischen Industrie (FCI). 2001 Dirac Medal of the World Association of Theoretical and Computational Chemists (WATOC).